Hosted at the “Losail International Circuit” in Qatar, the MotoGP World Championship is headed off by a specially built M6 Gran Coupe, complete with lights and a special M-themed paintjob. MotoGP is to motorcycle racing what F1 is to car racing: the fastest bikes, the top riders and an international circuit. Riders often top 210mph during races. However, pace cars (instead of pace bikes) are used in the same way they are utilized in auto racing. This marks the 15th year for BMW as the Official Car of MotoGP. 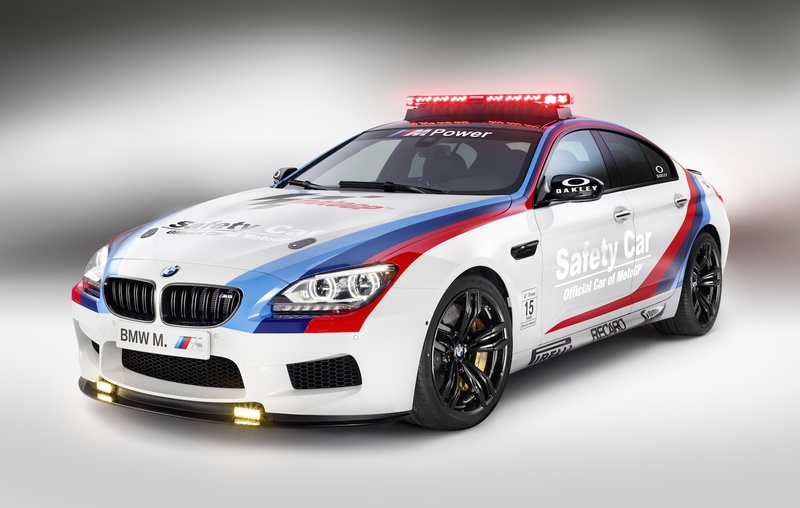 This year’s Safety Car is the BMW M6 Gran Coupe. Although the MotoGP M6 Gran Coupe pace car is literally flashy, it’s the car itself that especially interests us. Powered by a high-revving twin-turbocharged V8 producing 560 horsepower, the M6 Gran Coupe will hit 62mph from a standstill in 4.2 seconds. Aside from its prodigious powerplant, the M6 Gran Coupe is able to achieve its impressive performance figures thanks to specially designed performance parts. For instance, BMW has fitted it with a carbon fiber reinforced plastic roof. As for the rest of the Safety Car fleet, BMW has sent four other BMW M and M performance models. Aside from the M6 Gran Coupe: “the BMW M6 Coupe and the BMW M5 will also be in action as Safety Cars. The Safety Officer will take to the track in a BMW M3 Coupe, while two BMW M550d xDrive Tourings will be used as medical cars,” according to BMW press release. Lastly, BMW has also sent along two HP4 motorcycles as Safety Bikes. While the M6 Gran Touring is cool, our eyes are immediately drawn to the two BMW M550d xDrive Tourings along with the two HP4s. We’d be happy to take either of those bad boys for a spin on the Losail circuit. Terms & Conditions: Should ignoring fine print be illegal?